My recent paintings express my love affair with this planet. After a day of painting, I want to bring my paintbrush to bear upon the evening sky, to drawings rivulets of melting snow create on pavement. As a young adult I lived by the sea. I spent my days wandering through pine forests, around ponds, and out to the ocean. My intention was to get lost in my surroundings, becoming one large mind hearing/seeing. When I got lucky I was rewarded with a wide perspective—seeing each individual tree in simultaneous sharp focus, hearing every pine needle fall. I experienced all the details—there was no sense of background, each detail was as important as any other. During the summer of 2009 I began painting a series of seascapes inspired by the ocean off Cape Cod. I took photos of waves on Truro's beaches and brought the photos back to my studio to create paintings. As time passed my focus broadened to differing light and weather, the transparent and reflective quality of water, sky and clouds. I branched out to other beaches including Pt. Pleasant, NJ and Long Island. 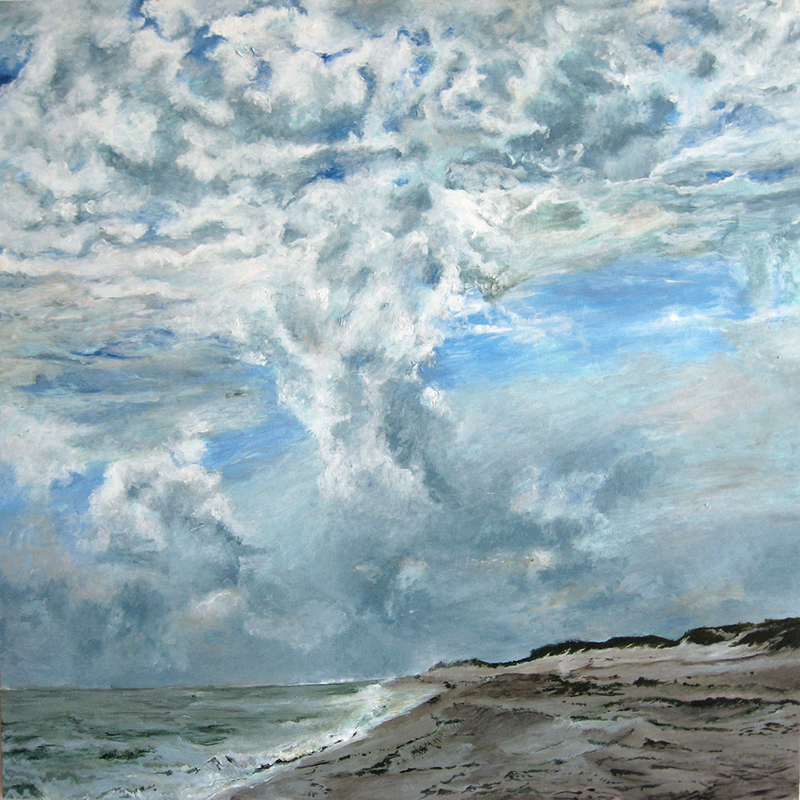 While working on my NJ seascapes, Hurricane Sandy hit and wiped out the beach I had painted. This inspired in me an urgent need to document the world around me in the face of climate change. So far the places I’ve been documenting are on Cape Cod, Long Island, Ipswich MA, and Vinalhaven ME.